Lock in a great price for Holiday Inn Madrid - Las Tablas – rated 8.1 by recent guests! Very spacious and comfortable room in a efficient location close to the city and the airport. Very good breakfast. It was ten minutes from the airport. We had an early morning flight, so that’s why we chose this facility. They also offered a king size bed, something that was hard to find in Europe. After I arrived they found a room available for early check in. Food was also good during breakfast. Very comfortable room with good location to stores and restaurants. Helpful staff made our short stay nice. It's an industrial area so there are a lot of restaurants and cafes to choose from. The room is very nice and well distributed. The entire place is very clean, you feel like in home. They allow us to stay till 13.30. Our family spent one night at the Holiday Inn Madrid - Las Tablas because we needed to travel to the Madrid airport the next morning to catch a flight and the hotel offers an airport shuttle service. I made the mistake of not carefully reviewing the facility details before booking to later discover that the airport shuttle is only available on weekdays and not available on weekends. No problem, we just took a taxi to the airport and all was well. The staff was professional and helpful. The rooms were clean and the included breakfast was very good. There is a supermarket located less than one block away and a variety of restaurants located within walking distance. Holiday Inn Madrid - Las Tablas This rating is a reflection of how the property compares to the industry standard when it comes to price, facilities and services available. It's based on a self-evaluation by the property. Use this rating to help choose your stay! Set in Madrid's financial district, Holiday Inn Madrid - Las Tablas is just 10 minutes' walk from the Las Tablas Metro Station. Free Wi-Fi is available throughout the building. The modern air-conditioned rooms feature a flat-screen TV and a desk. The private bathroom is equipped with a hairdryer and luxury toiletries. Holiday Inn Madrid - Las Tablas has a stylish lounge, restaurant and bar. The hotel is located in the city’s Fuencarral district, near Universidad Autónoma de Madrid. IFEMA Trade Center is 15 minutes' away by car. Theme Park Micropolix and Warner Bros Park are easily accessible by car within a 15-minute drive. When would you like to stay at Holiday Inn Madrid - Las Tablas? Larger room with a double bed located on the 6th floor. Features Wi-Fi, flat-screen TV, wardrobe, safety deposit box and desk. 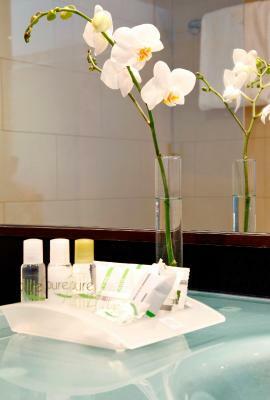 Private bathroom has a shower, hairdryer, free toiletries such as shampoo, conditioner, lotion or shower cap. An iron, mini-bar and electric kettle are also provided. Free tea and coffee. There are 2 bottle of water and a chocolate bar for free. A room with a double bed or 2 single beds located from 1st to 5th floor. Features Wi-Fi, flat-screen TV, wardrobe, desk and safety deposit box. Private bathroom has a shower and hairdryer. There is also a mini-bar and electric kettle to prepare free coffee and tea. A room with 2 single beds. Features Wi-Fi, flat-screen TV, wardrobe and desk. Private bathroom has a wheelchair accessible shower and hairdryer. There is also a mini-bar and electric kettle to prepare free coffee and tea. Extra-large room with a double bed located on one of the top floors. Features Wi-Fi, flat-screen TV, wardrobe, safety deposit box and desk. Private bathroom has a shower or bath, hairdryer, free toiletries such as shampoo, conditioner, lotion or shower cap. An iron, mini-bar and electric kettle are also provided. Free tea and coffee. 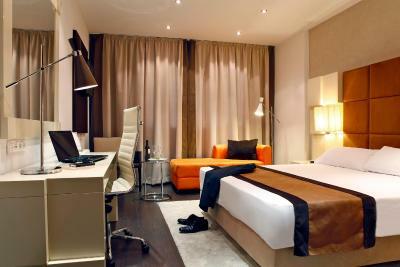 Holiday Inn Madrid - Las Tablas provides the highest quality level both in its installations. Services and facilities like complimentary Wi-Fi, large working desk and daily newspapers at the breakfast lounge, make this hotel ideal for business travelers. Our hotel is located near Barajas International Airport and IFEMA convention, congress and trade show centre. Theme Parks like Micropolix which is only 15 minutes away and Warner Bros Park are easily accessible. Our hotel offers 132 modern and welcoming guest rooms including suites and executive rooms where you will feel at home whether you are visiting the Capital for leisure or any sort of social or business event. Our guests can enjoy an excellent breakfast buffet beside of our local Spanish gastronomic offers at our restaurant or new lobby bar which are ideal either for a business lunch or a social get together. House Rules Holiday Inn Madrid - Las Tablas takes special requests – add in the next step! Holiday Inn Madrid - Las Tablas accepts these cards and reserves the right to temporarily hold an amount prior to arrival. Great comfort with the reasonable price. Good location - easy access to metro, close to airport. Clean room, good service. Fabulous breakfast choices, easy parking, extremely helpful staff and easy walking to the station to get the metro into Madrid. The receptionist Carlos. he was very helpful and friendly. The breakfasts were valur for money too! Air Con did not work at the time but that was a minor problem as weather wasn’t warm. No working aircon. The room was uncomfortable and had to turn the fan off (which blew hot air) and leave the window open.